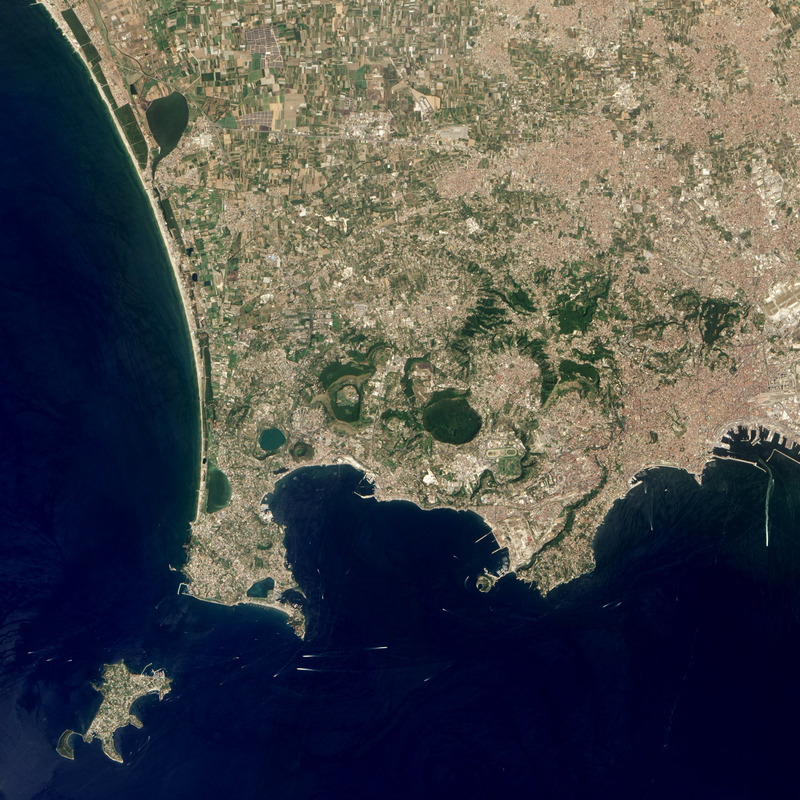 The Campi Flegrei caldera cluster is the largest volcanic feature along the Bay of Naples, which is also home to the more famous Vesuvius. 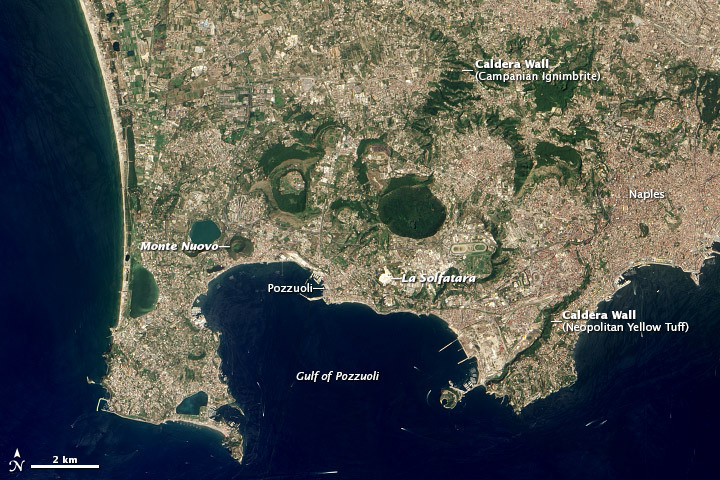 The Campi Flegrei, or “Fiery Fields,” is built from a series of overlapping volcanic features—calderas, domes, and cinder cones—that are historically active. The Campi Flegrei calderas have produced two of the largest eruptions Europe has seen in the past 40,000 years. The Neopolitan Yellow Tuff (rock composed of fragments of material embedded within volcanic ash) was erupted roughly 12,800 years ago, with a total volume of at least 40 cubic kilometers (10 cubic miles). The Campanian Ignimbrite (rock made from the fused remnants of a pyroclastic flow) is about 32,800 years old and has a volume of at least 100 cubic kilometers (20 cubic miles). Since the Neopolitan Yellow Tuff was formed, numerous small eruptions have occurred in the caldera complex, mostly less than half a cubic kilometer (0.1 cubic miles) in size. The most recent eruption occurred in 1538 at Monte Nuovo, a small cinder cone; that strombolian activity killed at least 32 people. The most obvious manifestation of the magma under the surface at the Campi Flegrei is the La Solfatara, a region of intense hydrothermal activity. There has also been repeated cycles of uplift and subsidence near the city of Pozzouli, sometimes on the order of meters per decade, along with degassing within the Gulf of Pozzouli. This natural-color image was acquired by the Advanced Land Imager (ALI) aboard the Earth Observing-1 (EO-1) satellite on July 9, 2012. NASA Earth Observatory image by Jesse Allen and Robert Simmon, using EO-1 ALI data from the NASA EO-1 team. Caption by Erik Klemetti, Eruptions Blog/Denison University. A basketball-sized lava bomb slammed through the roof of a tour boat near an active fissure of Hawaii’s Kilauea volcano early Monday morning, showering the vessel with debris and injuring 23. Lower East Rift Zone: Lava from Fissure 8 is flowing to the ocean, but could break out of channels and threaten the community of Nanawale (675 homes, pop. 1,384). Ocean entry remained fairly broad with laze blown onshore. Lightweight volcanic glass continues to fall downwind; high winds may waft lighter particles to greater distances. Summit: Seismicity continues to increase, with a series of M5+ earthquakes likely caused by explosive volcanic activity over the last 48 hours. Sulfur dioxide emissions are lower than they have been, but remain at dangerous levels.